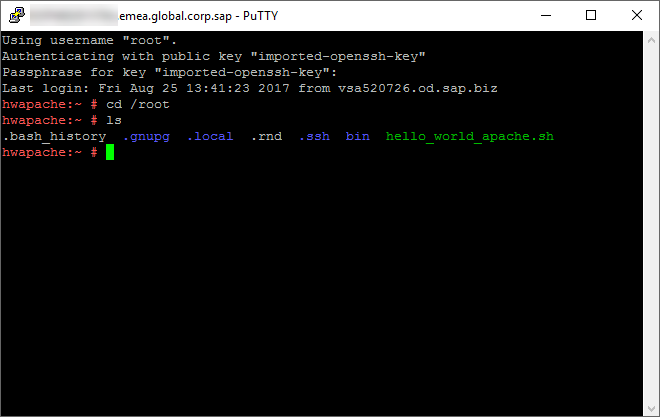 This tutorial describes how you can run a simple HelloWorld web application on an SAP Cloud Platform virtual machine using Apache. The hello_world_apache.sh file, that we are going to use in this tutorial, contains the following code. Create a blank .txt file, transfer the code there, and save it as an .sh file with the exact same file name. 1.1 Open your console client and go to the tools folder of your SDK by executing the cd <path to your SDK tools folder> command. After your virtual machine is created, look for the virtual machine key usually located in your SDK folder. Follow the instructions in step 2 to convert that autogenerated key from .key to .ppk format. 2. Connect to the virtual machine. Load the autogenerated key (select Load or Conversations → Import key). In PuTTY, open the Connection → SSH → Auth tab and add the converted private key. Open Advanced settings and then open SSH → Authentication. 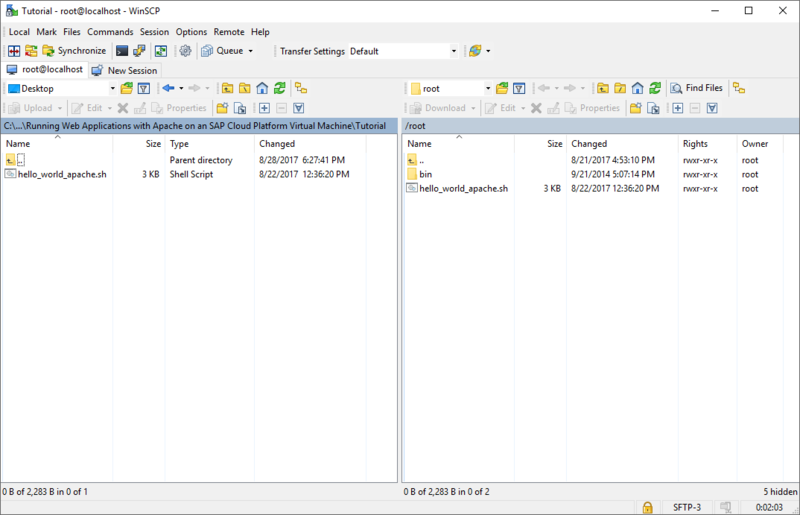 The idea behind using the WinSCP client in this tutorial, is to allow you to transfer the hello_world_apache.sh script file from your local file system to the virtual machine. The .key file conversion together with the PuTTY and WinSCP login steps are also described in Setting up an SSH client to connect to HCP Virtual Machines. 3. Open an SSH tunnel to the virtual machine. 4. Upload the hello_world_apache.sh file in the virtual machine. After you have started a WinSCP session, find and open the local folder containing the .sh file. Then, drag and drop it, for example, in the root folder of the virtual machine. 5. Execute commands in PuTTY. Note: First, make sure that you are in the right folder. Let’s assume that the .sh file is transferred to the root folder of the virtual machine as mentioned in step 4. In this case, run the cd /root command in PuTTY to go to that folder. And if you want to double-check that the .sh file is there, run the ls command to list all available files in that folder. The first command gives you the right to run the script. The second command executes the script. Note: The hana.ondemand.com region host is valid for the Europe (Rot/Germany) region. If your virtual machine is hosted on another SAP Cloud Platform region host, choose one of the other available options at Regions and Hosts. 6. Register an access point for the virtual machine. – Go to the overview page of the virtual machine in the cockpit and select Expose to Web. Result: In either case, you should receive a URL like this one: https://[myvmname][mysubaccountname].vms.hana.ondemand.com. This is what the URL of the virtual machine should look like. 7. Open the URL of the virtual machine. I hope that this tutorial was helpful to you. If you run into some problems while going through the steps, don’t hesitate to share your feedback!